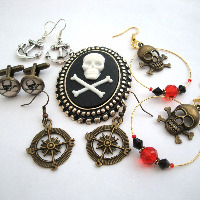 Pirate inspired jewellery ~ my treasure chest of stylish pirate themed bracelets, necklaces, earrings and jewels for your day-to-day or special occasion pirate attire, or hair beads and accessories for a pirate fancy dress costume! 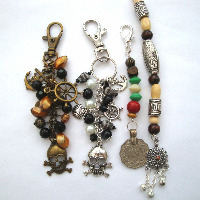 All are designed and put together by Cap'n Jane herself, if you'd like to commission something special for yourself please send a message via the Contact form! 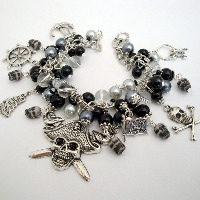 I have made sets of bride and bridesmaid bracelets for pirate themed weddings and can design for you based on your wedding colour scheme. What is Steampunk? Here's Wikipedia's answer: "Steampunk is a sub-genre of fantasy and speculative fiction. The term denotes works set in an era or world where steam power is still widely used—usually the 19th century, and often Victorian era England—but with prominent elements of either science fiction or fantasy, such as fictional technological inventions like those found in the works of H. G. Wells and Jules Verne, or real technological developments like the computer occurring at an earlier date." 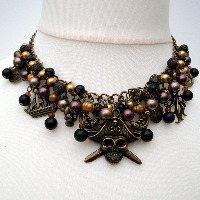 As far as jewellery is concerned, Steampunk is full of watch movements and pocket watch cogs, mechanical pieces intermingled with wings and underwater creatures and Victoriana.